Pieter van der Keere New and Accurate Map of the World c. 1620 Original Engraving c1620 Softcover P.
Kerius, 1620 Very Good Condition Book Publishing Details. 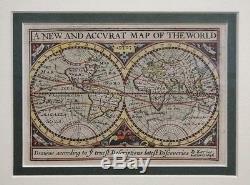 New and Accurate Map of the World c. Comments & Item Features c1620. Era: Renaissance 16thc to 17thc. Date is approximate based on van der Keere's publication history. An original colour engraving, overall a little toned and browned, generally commensurate with its age. Light creasing and a small tear to top-left corner, not greatly imposing upon the printed image. Otherwise well-preserved, clear and attractive. The print measures 130 x 90 mm, and is laid-down onto board, professionally mounted and framed. We are Maynard & Bradley CAMBO & PBFA (now lapsed) members here in Leicester City Centre. Book Condition Report: Book Condition: Very Good Condition. We have tried to be honest in our descriptions but may have missed mentioning the odd minor blemish or two. 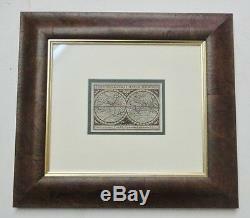 Over 2kg we use mainly UPS Keywords this Item & Common Mis-spells BZDB216 NOISBN Keere, Kerius, Map, World, Atlas, Original, Renaissance, Engraving, Antique Antiquarian & Rare; Britain/UK; Renaissance 16thc to 17thc; New and Accurate Map of the World c1620 Original Engraving. The item "VAN DER KEERE New and Accurate Map of the World (c. 1620 Original Engraving) 1620" is in sale since Friday, December 16, 2016. This item is in the category "Books, Comics & Magazines\Antiquarian & Collectable". The seller is "antikbuks" and is located in Leicester. This item can be shipped to United Kingdom.